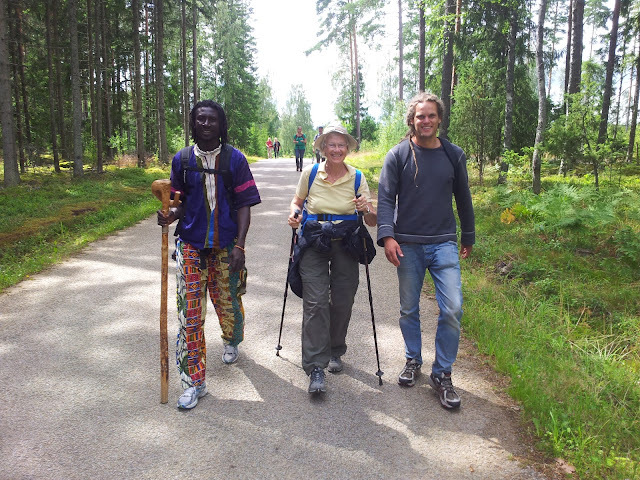 Papis, Gunilla and Peter on the go. seems to be a truth others can relate to. all in the circle recognized ourselves in so much of their stories. other side of the circle. other without any kind of problems. There are no hindrances, only curiosity. are no stumbling blocks, only confirmations that we are on the right road. opportunities to learn from each other. still, so perfect, so divine. from Rättvik something wonderful happens. The choir sounds surprisingly well! good vibrations with the last rays of the sun. What’s happening? afterwards. ”And it worked!” I could add. Don’t ask me how – but worked it did! behind? If we sing a song of grace ungracefully, we should rather keep quiet. happily with the music and fellowship still in our hearts. and tradition, and the paths they have walked to get where they are now. Sadhu at Ulla’s story even I started to feel that this is a fantastic story. chakras spun around affirmingly, rejoicing in pure bliss.